This St. Patrick’s Day cookies post is courtesy of our contributor Leah…With the recipes for sugar cookies and royal icing – it’s about time to put them together. 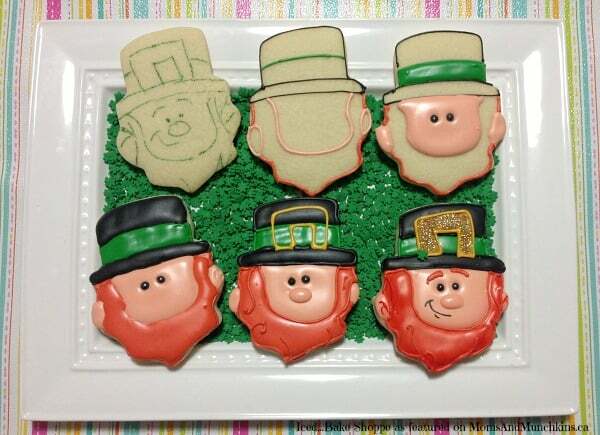 With St. Patrick’s Day approaching, why not put the two together into cute, edible leprechauns? These St. Patrick’s Day cookies will be a hit with both kids and adults! Need incentive to buy the set? 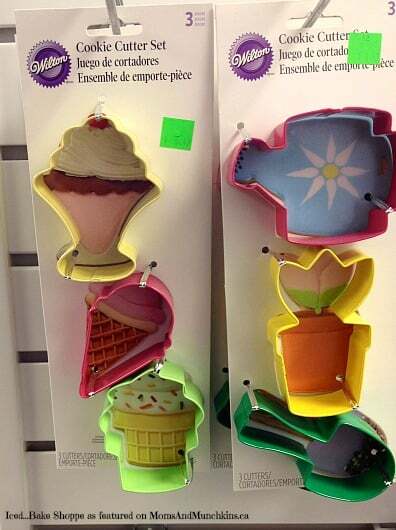 These cookie cutters have many uses and are more versatile than some of the other ones. The pink cutter is easily transformed into a boy or girl wearing a birthday hat or a clown. The yellow ice cream sundae can be used for fish. There are oodles of uses for basic cookie cutters and for $5.49, why not? I will do another neat tutorial with one of the accompanying cutters soon – I promise! To make the St. Patrick’s Day cookies below – I used a few techniques that you can implement or adjust to your skill level. If you are a beginner – I recommend investing in some food color markers. Wilton makes them and they are readily available at Michaels Craft Stores. This way you can sketch on all your cookies until you have the basic shape you are going for. If you mess up this step – no worries, as most of it will be covered in icing. In the photos I used green so that it could easily be seen in the picture, but yellow is best as it is the least noticeable if any of the outline doesn’t get covered. Mix all your icings and have them handy. 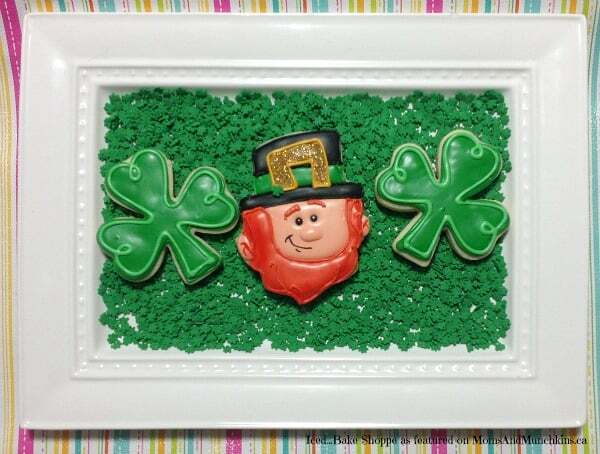 Outline the St. Patrick’s Day cookies with piping icing (with the black, green and red). Once you have completed this step – color the face and the ears (ears are optional) with flesh colored flood icing. Once filled, I dropped two black sugar pearls in place with tweezers for eyes. Eyes can be piped on later, but the pearls give the cookie a nice dimension. Now, fill in the band of the hat. For our demonstration, this was green but he would look just as charming with a green hat with black band. Leave cookies to dry for ~30minutes to an hour. This will prevent other icing colors from bleeding into each other. Fill the hat with black flood icing, and fill the beard with red/orange icing. Let dry for at least an hour, overnight if possible. Outline each section with applicable colored piping icing and add details with piping icing (swirls of beard, eyebrows). You will want to use your flesh colored flood icing to pipe on a nose beneath the eyes. If you haven’t used sugar beads, you can pipe on the eyes out of black, or add them with the food color markers. If you are not using disco dust – you can outline and flood the yellow/gold buckle now. If you want to use disco dust – you will need to wait until the other icing is completely dry. Once dry – place cookies over parchment paper, add buckle and sprinkle with edible glitter and leave to dry completely (~4hr to overnight). Afterwards, use a soft paint brush to brush off excess glitter onto parchment paper. Once dry, outline buckle further if necessary. A bit of food coloring in your cookie dough while mixing it together can instantly turn typical cookies into something that really stands out. Leprechauns on green cookies? Why not? Drying Cookies: This is going to sound a little strange but I promise you home cooks – it works! I know that drying cookies can often take up a lot of space, and require a lot of patience. It can also be testing if you have curious little fingers in your home (or even furry paws). If you want your cookies to be safe, and dry a little bit quicker – stick them in a cool oven and leave the oven light on. Most oven lights give off heat and this will keep the cookies safe. Just don’t forget them in there. I cannot tell you how many times I’ve gotten an email from someone who forgot their cookies in there and preheated for something else! Whoops! Icing: Need piping and flood icing in the same color? Mix up a batch of the color to piping stage, and take out what you need. Then continue to add liquid to the remainder until it is at flood stage. This way, they are the same color and there are less dishes. It can be nearly impossible to make the same exact a second time – so always overestimate a little. As you make more cookies – you will get much better at knowing how much icing you’ll need. Colors: I know there are a lot of food colors (especially if buying from Americolor), but as a beginner or as a hobbyist – there is no need to buy them all. Terracotta? Lime green? Gold? With the basic colors, you can whip up most colors necessary. The beard in these cookies is very similar to a food coloring called “Burnt Orange,” but we mixed a bunch of orange with a bit of red and voila! Gold? For this tutorial (as well as the Oscar statue cookies seen previously on Moms & Munchkins), it was a mix of yellow with a tiny bit of chocolate brown. You cannot make true gold icing – but with petal dust or an airbrush, you can get it metallic. The Oscar statues were two yellow/brown icings (one lighter than the other), with gold sheen airbrush to really make them shimmer. Fleshtones? There is no one-size fits all answer here but with a few colors (ivory, chocolate brown, warm brown, pink, and black), most skin tones can be created. Americolor makes a color called “copper” that works very well for Caucasian skin tones. For light skin, start with a base of ivory and add a little warm brown at a time until you get the right shade (sometimes a hint of pink as well). For medium skin tones, a chocolate brown-ivory-warm brown mix. For dark skin tones, mixing dark brown-chocolate brown-and a tiny bit of black will usually do the trick. Skin colors will take some practice, so just add colors slowly until you get it right. Remember, the colors will dry a shade or two darker than the color they appear when wet. A sweet, holiday treat that has a lot of personality. With the handmade nature of these St. Patrick’s Day cookies – no two leprechauns will be the same and that just adds in the fun of it. With a quick trip to your local craft store, it will be a snap to whip up some St. Patrick’s Day cookies for the little Leprechauns in your life. 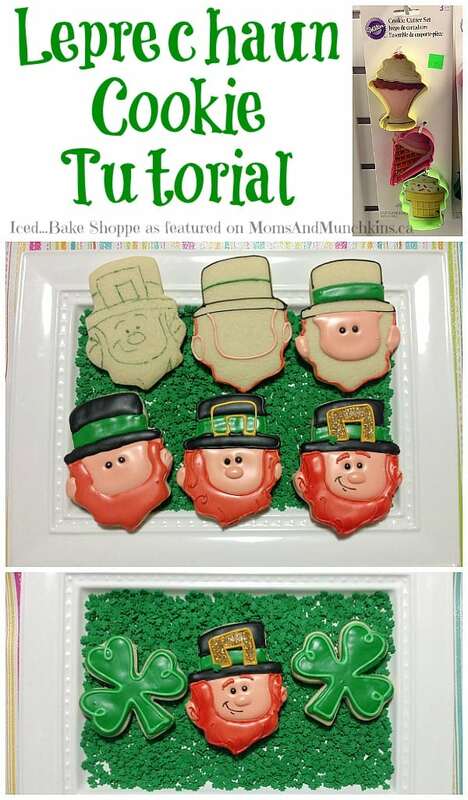 A big Thank You to Leah of Iced…Bake Shoppe for sharing this delicious St. Patrick’s Day cookies tutorial with us. For more creative ideas, you can follow her on Facebook. You can also order delicious desserts from Iced…Bake Shoppe for your next event. They ship throughout the US and Canada! Be sure to visit our St. Patrick’s Day page for more recipes, activities, freebies and more! For more family fun ideas, follow Moms & Munchkins on Facebook, Twitter, Pinterest, Google + and Bloglovin’. Just wanted to let you know I am sharing your wonderful post in my 100 Something Green St. Patricks Day RoundUp http://wp.me/p466oG-11f with a link back to your original post plus pinned to my St. Patricks Day Board! Have a terrific weekend!